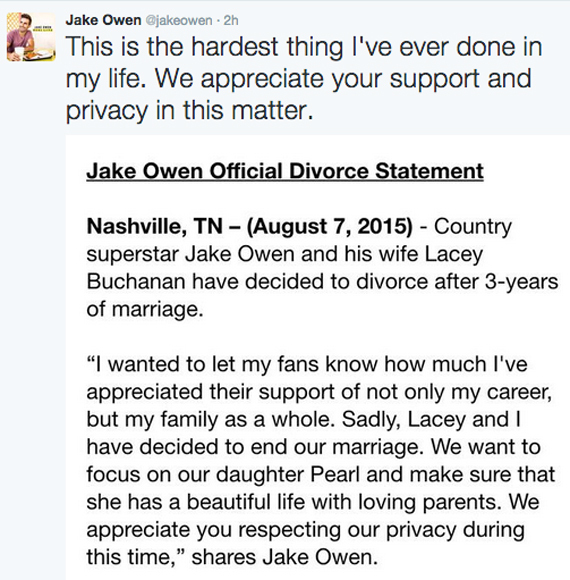 Jake Owen released a statement via Twitter today announcing he and his wife Lacey Buchanan have decided to divorce after 3-years of marriage. Together they have one child, Olive Pearl Owen. The two were married on May 7, 2012 in his hometown of Vero Beach, FL after a one month engagement and a year of dating. The couple met on the set for Owen’s music video “8-Second Ride” and the bride also starred in his “Barefoot Blue Jean Night” video.